Bearing the name he shows forth the deed. Though dead he appeared as if not dead. 1. Moses, the divine legislator, who laid bare the bottom of the sea, flooded with water the moistureless desert and worked all the other miracles, wrote down the way of life of the holy men of old, not using the wisdom he had adopted from the Egyptians but receiving the splendor of grace from on high. For from what other source could he have learnt of the virtue of Abel, the devotion of Enoch, the righteousness of Noah, the priestly piety of Melchizedek, the call, faith and endurance of Abraham, his attentive hospitality, the celebrated sacrifice of his son and the list of his other achievements, and, to speak in summary, the contests, victories and utterances of those glorious men, if he had not received the rays of the rational and divine Spirit? I too need this assistance at present, as I try to write down the life of the glorious saints of our own time and the recent past, and seek to set out a rule, as it were, for those who wish to emulate them. I must therefore invoke their prayers, and so begin my narration. 2. Nisibis is a city on the frontier of the Roman and Persian empires which formerly paid tribute to the Romans and was subject to their sovereignty. Originating from this city, the great1 embraced the eremitical and quiet life, and gaining the tops of the highest hills lived upon them. In spring, summer, and autumn he used the thickets, with the sky for roof; in the winter season a cave received him and provided scanty shelter. He had food not sown and produced with labor but that which grows up by itself: it was by gathering the natural fruits of wild trees and edible plants and vegetables that he provided his body with the bare necessities for life, rejecting the use of fire.2 Also superfluous for him was using wool: the roughest goat's hair filled its place, for from this were made both his tunic and his simple cloak. 3. While he thereby wore down his body, he provided his soul unceasingly with spiritual nourishment. Purifying the eye of his thought, he prepared a clear mirror for the Holy Spirit; and 'with unveiled face, beholding as in a mirror the glory of the Lord,' in the words of the divine Apostle, he was 'changed into his image from glory to glory, as from the Lord the Spirit.' And so his familiar access to God increased every day, and his requests for what he needed to ask from God were granted immediately. So too he possessed prophetic foreknowledge of the future and received by the grace of the all-holy Spirit power to work miracles.3 I shall recount a few of these, to reveal to those unacquainted with them the luster like that of the Apostles that shone in him. 4. At that time the madness of men over idols was in full vigor, lifeless statues usurped divine honors, and the majority of men paid no heed to the worship of God. Contempt was the lot of those who refused to share in their sottishness and, because of firm stability, had an accurate discernment of reality, who laughed at the feebleness of the idols and worshiped the Creator of the universe. In this period James went to Persia, to observe the piety planted there and convey to it the help it needed. As he was passing by a spring, some girls who were standing at washing-troughs and cleaning clothes under their feet, far from feeling awe at his novel appearance, cast aside all modesty and stared at the man of God with brazen looks and eyes dead to shame. They did not cover their heads, nor even let down their clothes, which they had tucked up. Indignant at this, the man of God decided to display God's power opportunely, in order to free them from impiety by means of a miracle. So he cursed the spring, at which the stream immediately vanished away; and then he cursed the girls, and chastised their impudent youth with premature grey hair.4 His words had immediate effect: their black hair was changed, and they looked like young trees decked in spring with the leaves of autumn. As the water of the spring ran away, and looking at each others heads they saw that drastic alteration, they perceived their punishment, and ran into the town to tell what had happened. At this the townsfolk rushed out to meet the great James, and begged him to calm his anger and remit the punishment. Without a moment's delay he made supplication to the Master and bade the water gush forth once more; immediately it appeared again out of its underground sources, recovering its course at the command of the righteous one. After receiving this favor, they begged him to restore to their daughters' hair its former color. It is said that he consented to this as well and asked for the girls who had received that correction, but when they did not appear he let the punishment stand, as a lesson in self-control, a reason for good behavior, and a perpetual and clear reminder of the power of God. 5· Such was the miracle of this new Moses, which did not result from the blow of a rod but received its efficacy from the sign of the cross. I myself am filled with admiration for his gentleness, in addition to his working a miracle. He did not, like the great Elisha, hand over those shameless girls to carnivorous bears, but applying a harmless correction that involved only a slight disfigurement he gave them a lesson in both piety and good behavior. I do not say this to accuse the prophet of harshness - may I be spared such folly - but to show how, while possessing the same power, he performed what accorded with the gentleness of Christ and the new covenant. 6. On some other occasion he saw a Persian judge give an unjust verdict. At this he laid a curse on a huge stone that lay nearby, and commanded it to shatter and explode, and thereby confute the man's unjust verdict. Immediately the stone broke up into a thousand pieces. The bystanders were panic-stricken, and the judge, now filled with terror, revoked his earlier verdict and decreed instead a just one. Here too James emulated his own Master, who, to show that he submitted to his passion freely and could easily have chastised the miscreants if he had wished to, did not inflict punishment on them but demonstrated his power by causing with a word the lifeless fig-tree to wither up. James too imitated this love for men when he did not chastise the unjust judge but by striking a stone taught him justice. 7. Because he was conspicuous for these actions and beloved by all and his name circulated in everyone's mouth, he was compelled to accept the office of bishop, receiving the charge of his native city.5 Although he exchanged that life on the hills and chose against his will to dwell in a city, he did not alter either his food or his clothing, but although there was a shift of place his way of life underwent no change. His labors took on increase and became far more numerous than they had been before: to fasting, sleeping on the ground and wearing sackcloth was now added the whole range of care for the needy - I mean looking after widows and tending orphans, reproving the perpetrators of injustice and justly assisting their victims. What need is there, for those who know it, to list all that besets those who have received this charge? James entered on these labors with exceptional eagerness, because he was exceptional in his love and reverence for the Lord of the sheep. 8. The more he acquired the wealth of virtue, the more he enjoyed the grace of the all-holy Spirit. Once, when he was on his way to some village or town - I am unable to indicate the place exactly - some poor people came up to him, displaying one of their comrades as dead and begging to be given what was needed for his burial. He yielded to their request and made supplication to God as for a dead man, asking God to forgive the sins of his life and count him worthy of the choir of the righteous. While he was saying this, the soul of the man, who had up to this point been feigning death, actually departed, and grave-clothes were supplied for the body. When the inspired man had gone on a short way, the concocters of this play-acting told the man laid out to get up. When they saw that he did not hear, that the charade had become a reality and the assumed expression had changed into a natural one, they overtook the great James; imploring loudly, prostrating themselves at his feet and saying that poverty was responsible for their audacious acting, they begged him to absolve their sin and restore the life taken away to the man laid out. Imitating the Master's love for men, he accepted their petition, and displayed his working of miracles by using prayer to restore to the man laid out the life that prayer had taken away. 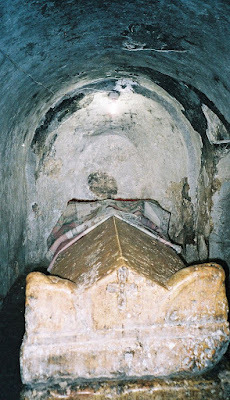 Tomb of St. James in the crypt of his church in Nisibis. 9. This seems to me to resemble the miracle worked by the great Peter, who consigned to death Ananias and Sapphira who had concealed and deceived, for James likewise deprived of life one who had concealed the truth and practiced deceit. But while the former recognized the concealment - for the grace of the Spirit revealed it - and so imposed the penalty, the latter, in his ignorance of what lay behind the acting, applied prayer as the remedy and thereby cut short the dissembler's course of life. Also, while the divine Apostle did not release the dead from their misfortune - for terror was needed in the first stage of proclaiming salvation -, James, who was full of the grace of an Apostle, both applied chastisement as the occasion demanded and then swiftly revoked it, since he knew this was what would benefit the wrongdoers. But now we must go on to other matters, and these too we must relate in summary. 11. After time had passed, that great and marvelous emperor departed life with the crowns of piety, and his sons inherited the sovereignty. Then the king of the Persians - Sapor was his name -, despising the sons as not equal in power to the father, marched against Nisibis with a huge troup of horse and a huge army on foot; he also brought the greatest possible number of elephants.7 Dividing up his army as for a siege, he invested the city all the way round, set up engines, built bastions and dug in palisades, fencing in the gaps between them by branches placed cross-wise. He ordered the soldiers to heap up mounds and raise towers against towers; on these he then mounted his archers, ordering them to discharge their arrows against those stationed on the wall, while he ordered others to undermine the wall from beneath. When all this proved ineffectual, frustrated by the prayer of the inspired man, he finally set a great number of hands to stop the course of the river that flows past; and stopping most of the river by damming so as to mass it together, he released it all at once against the wall, using this as some mighty engine. The wall could not take the shock of the water: shaken by the impact, the whole of it along this stretch fell down. They let out a great cry, as if the town would now be easy to capture, for they knew nothing of the great bulwark of the inhabitants. Seeing the city made inaccessible by the water, however, they postponed the assault. So now that their labor had abated, they withdrew to a distance to rest themselves and tend their horses. The inhabitants of the city had recourse to still more urgent prayer, with the great James as their intercessor. All those of age hastily rebuilt the wall, paying no attention to beauty or due arrangement but putting everything together haphazardly, stones, bricks, and whatever anyone could carry. In one night the works went forward and reached a height sufficient to prevent the charge of horses and the access of men without ladders. Then they all begged the man of God to appear on the wall and rain down curses on the enemy; he agreed and went up, and seeing the innumerable host besought God to send on them a cloud of gnats and mosquitoes. He spoke and God sent, persuaded as by Moses. The men were wounded by the divine bolts; and the horses and elephants, bursting their bonds, ran hither and thither in confusion, unable to bear these stings. 12. When the impious king saw that all his machinations had failed to bear fruit, that the assault by means of the river had been fruitless (since the wall that had fallen down had been built up again) and that his whole army was in distress from its labors, suffering from the open air and harassed by the plague sent by God, - and when too he saw the man of God walking on the wall and supposed it to be the emperor himself supervising the work, as he was seen dressed in purple robe and diadem, - he was indignant against those who had deceived him and persuaded him to march, saying the emperor was not present. After passing sentence of death against them, he disbanded his army and returned to his own palace as quickly as he could. 13. Such are the miracles that God wrought in the case of this Hezekiahk also, not inferior to those earlier ones but greater, it seems to me, for what miracles could surpass a city's not being taken despite its wall falling down? I myself, in addition to this, am also filled with admiration at the way James, when applying a curse, did not ask for the introduction of thunderbolts and lightning, as the great Elijah did when each of the commanders of fifties came to him with his fifty. He heeded the Lord, saying explicitly to James and John when they tried to work this same miracle, 'You do not know of what spirit you are.' Therefore he did not ask for the earth to gape under them nor did he call for the army to be consumed with fire, but rather that it be wounded by those tiny creatures and, recognizing the power of God, at some later date learn piety. 14. So great was the familiar access to God that this man of God possessed, so great too was the grace he enjoyed from above. Persevering in these and growing each day in the things of God, he laid down this life with the greatest renown and set out on his migration from here. After time had passed and this town was handed over by the then-emperor to the kingdom of Persia,8 all the inhabitants of the city departed, but took with them the body of their champion, aggrieved and bewailing their exile, but chanting the power of their victorious hero; for if he had survived they would not have come under barbarians. Having proceeded through these particulars concerning the man of God, I shall move on to another narration, begging to receive a share of his blessing. 1. James was first a hermit in the mountains near Nisibis (in Mesopotamia) and later bishop of the city. We know from other sources that he died in 337-8. Ephraim's Carmen Ntsibenum XIV (written in c.359) mentions James's fasting and simple preaching, and describes him as the bishop who 'gave birth' to the Church of Nisibis. 3. The theme of the purified soul as the mirror of God was conventional by Theodoret's time and so cannot be pressed as indicative of his understanding of the spiritual ascent. More noteworthy is the idea that it is the self-purification enabled by withdrawal into solitude that wins for the holy man the gifts required for helping his fellow-men through prayer and the working of miracles: eremiticism and the life of charity are not opposed. 4. On Syrian holy men as 'notable cursers', see P. Brown, 'The Rise and Function of the Holy Man,' 122. The James legend clearly relished miracles of punishment: it is notable how Theodoret is determined to interpret them as evidence of God's mercy. 5. 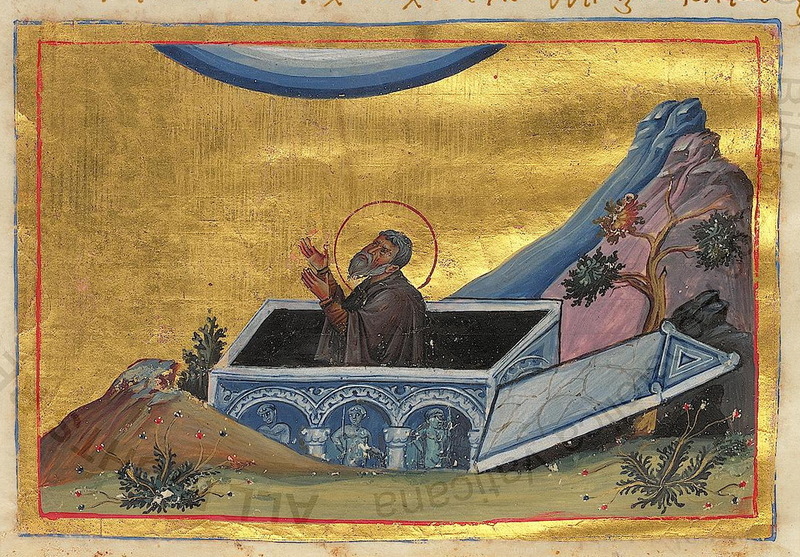 Stories abound of ascetics, or would-be ascetics, yielding to ordination only under compulsion, partly through humility and partly because pastoral responsibilities excluded a purely contemplative life: examples include St Augustine, Daniel the Stylite, and Macedonius of Antioch (Rel. Hist. 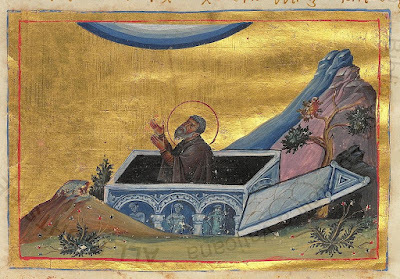 XIII.4). Pastoral responsibilities could, however, be seen as a simple extension of the holy man's care for his clients and visitors, and the ordained holy man could in his new sphere make effective use of the charismatic gifts he had gained through his asceticism. 6. This account of James' involvement in the death of Arius is fictitious: James's presence at the Synod of Nicaea is confirmed by other evidence, but Arius actually died at Constantinople in 336, eleven years later. The correct account is given in Theodoret, Eccl Hist. l.14. Canivet and most editors of the Rel. Hist. deduce that the treatment of Arius's death in this section must be a later interpolation, but the stylistic evidence favors its authenticity, and the whole section becomes pointless if no special achievement is attributed to James at Nicaea. Theodoret was certainly indifferent to chronological accuracy: e.g., the siege of Nisibis that involved James is dated in the Rel. Hist. to 337/8 but in the Eccl. Hist. (ll.30) to c.360. 7. Sapor II of Persia took advantage of Constantine's death in 337 to make an incursion into Roman Mesopotamia, and laid siege to Nisibis for two months. Contrary to the lesson related here, and repeated in Theodoret, Eccl. Hist. II.30, James died during the siege, and Ephraim attributes protection of the city to James dead rather than James alive (Carmina Nisibena XIII.19); the details of the siege given here are an embroidered version of the later siege in 350. 8. In 363 the emperor Jovian surrendered Nisibis to the Persians.